My main intention was to do something fairly different and to stand out. My initial feel for the challenge was to make the shot really cinematic and have an almost film quality to the final piece, again going against the dark and stormy atmosphere normally associated with tornados. I chose to do a waterspout with the hope not many other people would consider going down that avenue. I built all the assets for this challenge using 3D studio max, with pflow for particle effects and some simulations. 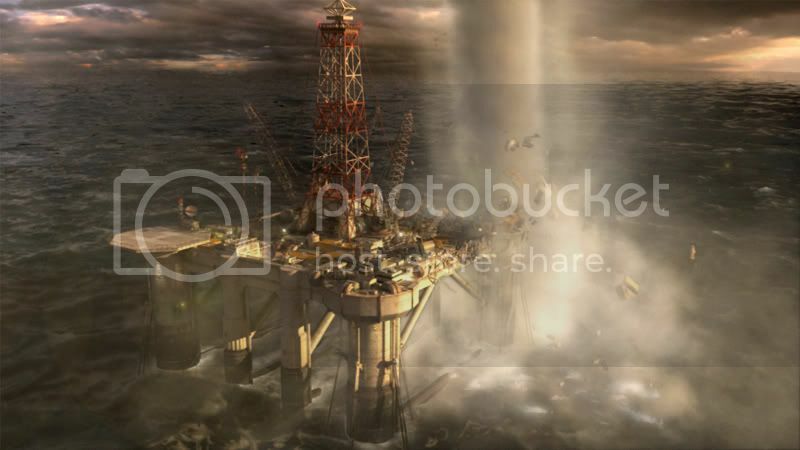 The spires, cranes, ropes, barrels, boats, secondary buildings and most of the debris on the rig was hand animated to complete the final effect. Volumetrics were done with After burn, FumeFx and all rendered in Vray. This time I just wanted to create a Tornado FX and participate, in the next challenge I´ll take more time to develop a better and more original idea.